Toba Villiage Inn is a new guest house with beautifull rooms and views of Samosir Island in North Sumatra The name of this tourist destination is Tuk Tuk, We have 26 rooms and one family room. The rooms have spring bed matress and mosquito nets, The bathroom is of western style for your comfort, All rooms have a terrace, Suite and deluxe rooms have a spectacular view of Lake Toba, Standard and superior rooms also have side views of the lake, All the rooms have a clear view our beautifull mountain, Standing at almost 1000 meteres the climate is ideal and especially at night when the cool wind makes sleeping a breeze, We have free carparking and free wi fi. Samosir is a short 4 hour drive from Kuala Namu international airport. the gareway to North Sumatra, There is an hourly boat service to bring you directly to our guest house, Our cook is an artist who specialises in local Batak, Indonesian and Western cusine who has five years experience cooking in Belgum, With over thirty years of experience our award winning bakery can provide you with warm wholemeal or white bread rolls for breakfast, You will love our afternoon tea garden where you can relax and enjoy our quality coffee, cakes and ice cream. Our priorty is to provide clean and healthy rooms and if requested we will clean the room daily. 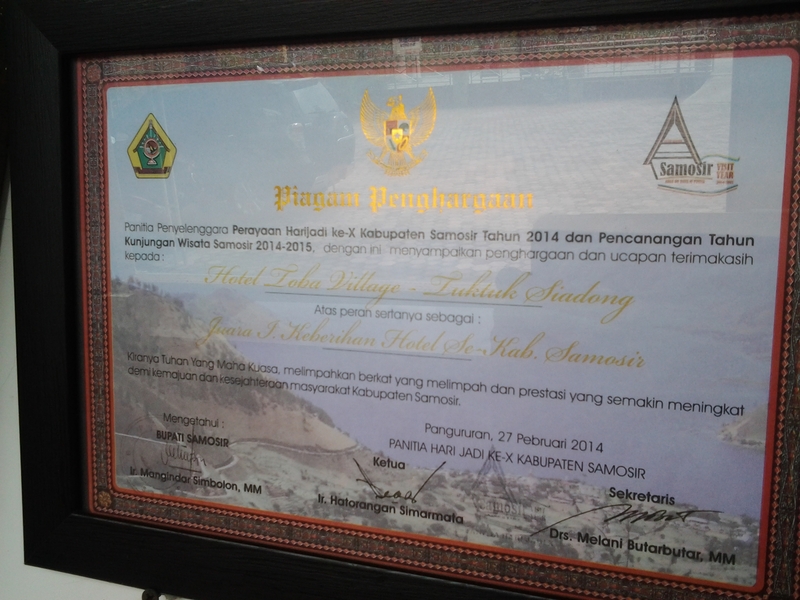 We are proud to have recieved the certificate for being the cleanest and best establishment on Lake Toba for 2014. We hope this information has been helpfull to you and we look foreward to meeting you on our island paradise. My name is Van Hooydonck Guido, I'm from belgium and I'm married to rotua Turnip. After years of working in my own baking company I felt it was time for a change. Because my wife is from this region we saw an opportunity to start a career in the traveling bussiness. 7 years ago we found tobavilla, and started to restore it to what it is now. We do this work with heart and soull am glad we made this huge step. Open every day from 06:00 am to 00:00 pm local time.